Buchanans isn’t just a shop. It’s a living room. A 6 year-old bursts through the door with a ukulele on his back. A 55 year-old plays Chopin on the old standup piano, and someone's got a fiddle, too. In the seaside town of Mahone Bay, people come to The Music House to practice, light sparks of imagination, and enjoy our community. Come to the bay for a walk or a coffee, for yarn from the knitting shop or syrup from the berry farm. Spot some pirates and try out that mandolin you've been eyeing. You'll see kids walking here after school, and parents relaxing in our cozy space. We sell and rent musical instruments and gear of all kinds, and we teach young and old alike. We even lend the talents of our circle to special events and celebrations. We'd love to see you at the house. Stop by and bang a drum, won't you? "We drop in to the music house whenever we're in town. It's an essential part of our bay rounds to browse and dream about my next banjo!" All our staff and teachers are professional musicians who are passionate about music and enjoy sharing their experience. 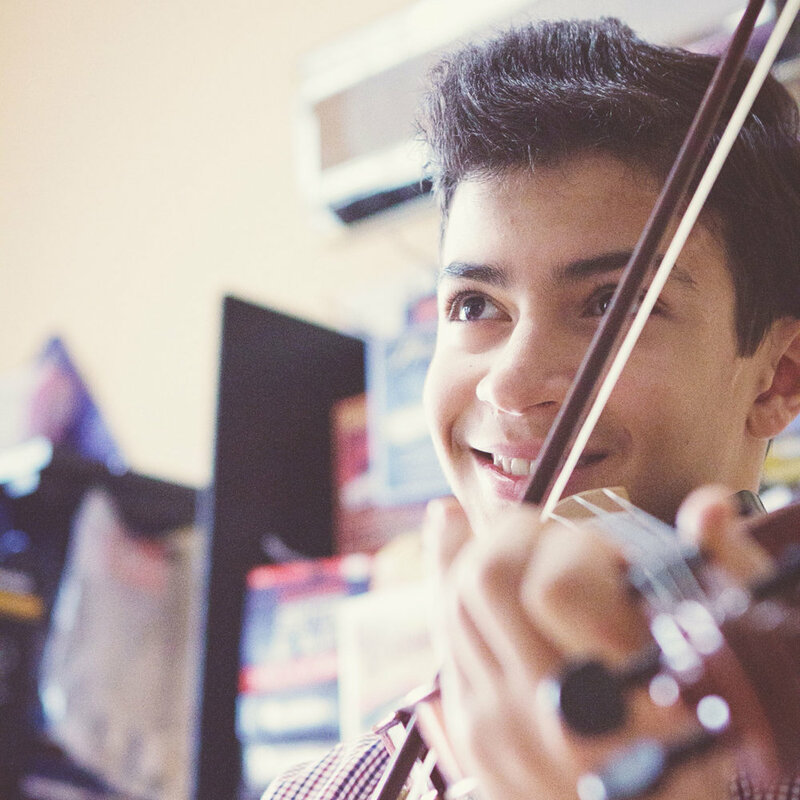 With four private instruction rooms, we offer individual lessons in fiddle, violin, piano, brass and woodwinds, guitar, bass, mandolin, accordion, percussion, voice, music theory, performance and songwriting. Contact us to match up with the right instructor to fit your personal and musical needs. All ages and abilities are welcome! From babies to 80s or anywhere in between and beyond, come to the music house for voice, strings (guitar, ukulele, mandolin, bass guitar, violin/fiddle, viola), percussion (hand percussion, bongos, djembe, drum kit), piano, accordion, flute, clarinet, saxophone, trombone, music theory, or songwriting lessons. Our summertime Rock Camp is a fun, confidence-building intensive for 9-18 year-olds. Aspiring young musicians of all levels will form a band and jam with pros, learning the ins and outs of live performance. We'll entertain family and friends with a rock show—one of the highlights of the year! Paula and Bev lead our tiny tunes classes with cheerful energy and movement for little ones. 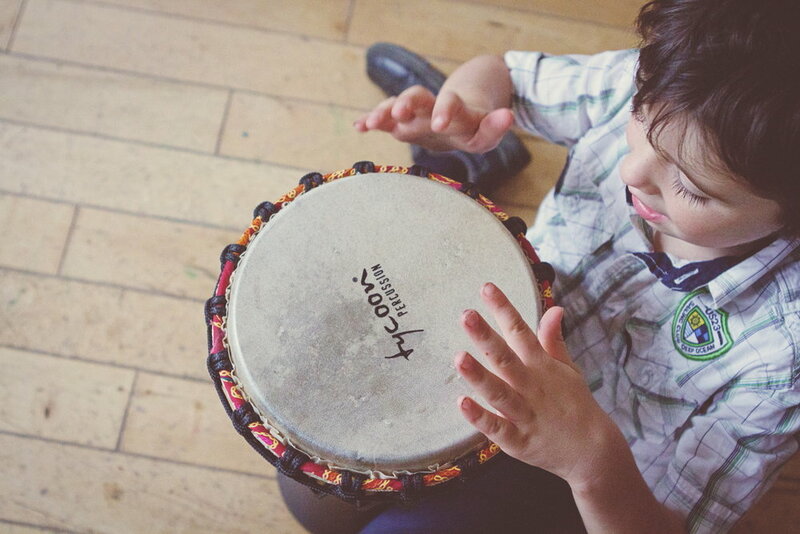 Buchanans is always a place to touch and experience musical instruments and all the marvellous sounds they make—but when the little ones take over the house, it's a free-for-all of song and play. Paul has played festivals and toured throughout North America. His album Alfalfa Honey topped the East Coast Countdown for four weeks, and his act Flat Fifth debuted at the ECMA main stage & garnered two nominations. He has accompanied songwriter Laura Smith, and performs in Eilidh and The Woolly Jumpers, The Flaming Jays, and Flat Fifth. Mikey's father and oldest brother played drums, and he first played his brother’s kit at 8 years old. From that moment he wanted to be a musician. At the age of 12, his parents bought him his first drum kit and he has been playing ever since. He performs independently and in the bands Dockyard Boxer and The Dead Minutes, and competes and teaches. Eilidh began playing at the age of eight in her hometown of Aberfoyle, Scotland. Inspired by her teacher Jacqui Mengler, Eilidh graduated with a music degree from University of Strathclyde and has performed worldwide—for J.K. Rowling in Edinburgh and with the award-winning band 'Belle and Sebastian'. She has been teaching fiddle ever since. For more than 30 years, Paula has performed, taught, conducted, and arranged oratorio, opera, musical theatre and jazz with many ensembles, from Canada’s National Youth Choir to the award-winning Halifax Camerata Singers. She is a member of the National Association of Teachers of Singing, and teaches at the Maritime Conservatory. A teacher for several years, Kendra was second chair in New Brunswick’s Senior Orchestra and played with theatre and musical productions. She majored in voice and jazz theory at NSCC and performs latin, R&B, funk, and jazz. She has played with The Lucy Grays and co-founded ECMA-nominated folk band The Barrowdowns. Nicola has years of experience teaching individuals and classes in Toronto, Montreal, and Lochgilphead, Scotland to a wide range of students of all ages, including autistic children. She studied Indian flute in Mayur Vihar, India, and has performed jazz and experimental music in Toronto. She has degrees in jazz and music education from Humber College and McGill University. Miranda learned piano from her grandmother, a teacher, and began formal lessons at age 5. She has taught for 10 years. She performed with an orchestra pit band and with Grafton Street Dinner Theatre, has played keys and sang for with a few bands, and performs for weddings and receptions. She fronts the neo-classical pagan folk metal band River Moss. RJ has played bodhran since 1993, with a top-end style Limerick and double-end Kerry. He has performed in Newfoundland bands Banish Misfortune and Tickle Harbor, and Nova Scotia’s Peelers Jacket and McMullen and St. Maurice, winning an ECMA for Roots Traditional Album of the Year for McMullen and St. Maurice’s Fingerboard Grooves in 2001. Mason has been teaching and playing music professionally for three decades, from rock and metal to blues, reggae, top 40, and folk. He studied the Berkeley Jazz theory method with former Hollywood studio musician Bill Schnare, and has played with Juno winners and nominees, backing up and trading solos with maestros such as Morgan Davis and Matt Anderson. In addition to joining us at the Music House, Bev has taught at the Nova Scotia Suzuki Violin Institute, the South Shore Waldorf School, and École de la Rive Sud. She leads the Val Meister Young Fiddlers' Workshop at the Lunenburg Folk Harbour Festival, and has explored the Canadian fiddle tradition with Gordon Stobbe, Kelly Trottier and others. Our guitar wall features quality acoustic & electric guitars of all levels at a range of prices. From great-sounding beginner guitars to handcrafted professional quality, we stock Seagull, Yamaha, La Patrie, Epiphone, and Beavercreek. We carry new Yamaha and Stentor violins and a small selection of lovely secondhand fiddles for growing players, along with a variety of accessories such as bows, rosin, and shoulder rests. We currently carry Yamaha and KORG keyboards, portables, and stage pianos, along with a variety of pedals, benches, stands, and accessories. We are happy to order in any model as requested by our customers. We have a great selection of hand percussion in-stock, such as djembes, bongos, bodhrans, and hand percussion. We carry LP, Toca, and Mano Percussion, and we stock Remo and Evans drum heads plus an array of kit accessories. We can bring in a selection of complete drum kits—from Mapex, Yahama, and Westbury. We have a fantastic selection of music books, from grade exams and tutorials to tune books in many styles. Our fiddle books include imported Scottish books, as well as Irish, Canadian, and Cape Breton tunes. Browse our stash for plenty on jazz improvisation, popular music, or blues, and learn with great music books and tutorials for beginners. We carry several lines of strings for electric and acoustic guitar, ukulele, violin, banjo, and mandolin, including nylon classical or coated strings. We carry a full line of reeds for woodwinds, and we stock rosin, cases, and just about any other accessory for most instruments. From mouth organs to fancy straps, picks, or shiny new toys, we've got all kinds of treats, essentials, themed musical jewellery and scarves, birthday gifts, and stocking stuffers to encourage and delight all the musicians in your life. We rent all manner of instruments and gear on a daily, weekly, or long-term basis for ongoing learning, holidays, or one-time events. Our in-shop sound technicians have worked as mixing engineers, professional musicians, and recording collaborators with well-known local artists. We can get you all set up for any kind of performing or recording endeavour, and can jump into projects of all genres with proficiency and good cheer. Contact us for booking information. Our instrument repair technicians have cared for beloved instruments, from repairing guitars dropped from a height and broken-necked banjos to infusing new life into inherited mandolins. Bring your tired, your cracked, and your downtrodden to The Music House for a spa day—and see how good they'll sound with some expert TLC. Contact us to arrange a drop-off or come by the shop anytime, and let us take care of the rest. Mason Macleod, our go-to guitar/mando/ukulele doctor, is a guitar builder, repair technician, and student teacher with Rizsanyi Guitars, as well as a certified Fender Guitars tech (acoustic and electric, silver level). He has helped to build guitars for the likes of Noel Redding and Peter Gabriel, and has 16 years of experience repairing stringed instruments of all kinds in retail stores, luthier shops, and as an independent. From a blow-the-roof-off Celtic extravaganza to a singalong house party with acoustic Beatles tunes to a peaceful harp in a field full of wildflowers, we have the right musicians and the right energy for your celebration—for birthdays, memorials, weddings, backyard parties, or corporate events. Contact us below to set the tone with the right music for you. Scotch/Irish or not, we'll get your guests dancing, laughing, and mingling together. As long as you can walk, you can ceilidh dance. If you're familiar with square dances or contra dances, then you already have a head start. Every ceilidh band is accompanied by a dance caller who will guide your guests through the steps. Include just the essential fiddles, or add Irish pipes, guitar, bouzouki, and flute to really make the floor shake. Book your band and caller for the whole night, or choose variety by ceilidh dancing for a couple of hours before you move into 1970s funk. Our dance caller, Niamh Webster, is a certified Irish dance instructor and owner/director of the Tir na nOg Irish Dance Academy. She has called ceilidh dances featuring Natalie MacMaster and Donnell Leahy, and with Juno award-winner Loretto Reid. Her energy is lively, contagious and instructive, and she'll help to make your event unforgettably fun. Paul: When I moved to Nova Scotia from 'Onterrible' in 2002, I was determined to do nothing but music: performing, writing, getting as much in the local scene as I could. I started teaching as well, and then I met Eilidh. She moved here from Scotland, and our daughter was born—and we decided to settle down and have a home to teach. Eilidh: I wanted somewhere that we could be a family and be together, but also be surrounded by music and make a life of it. A musical home, as well as a family home, is just what we wanted. Paul: We came to Mahone Bay in particular because it's such a family sort of place—we wanted to walk everywhere, know our neighbours, and be a part of a creative, fun community with lots going on. Eilidh: I wouldn't want to be somewhere bigger and be busier. Mahone Bay is such a special place, and the musical circle that we've been able to bring together draws people from all over for lessons and to play together. Paul: As a teacher and as a professional musician, it's so exciting and sweet to witness the moment when a student really catches on. That moment when they get it. When you teach a kid the blues scale and he's got his first solo, and you can see that he or she plays with so much pride and sass—I love seeing that. Eilidh: It's the same feeling when new fiddle players click to the idea that you play with a fluid wrist—as soon as that happens, they start getting so much faster and more loose and smooth, and they start to emote through the music. It's a really cool moment to see someone, even kids, break into that territory musically. Paul: There' s a lot of that at Rock Camp—kids playing together in a band, and you see the five of them click at the same time. Teaching individuals is great, but we want to extend everyone's playing, no matter what the instrument or genre, to the point where we start connecting players for different ensembles. That's when everyone's creativity really blossoms. Eilidh: In the future, we'd love to have a performance space, too—we'd love for our students to perform more regularly, with lights and PA systems and everyone being able to cheer each other on. I was twelve years old when I joined a band for the first time, playing fiddle with much older musicians, and it was such an inspiration. My mom didn't have to remind me to practice anymore. I was self-motivated. We'd love to bring more of that energy to the Music House, because it's so effective for learning. Paul: Music is fantastic to keep the brain nimble and stimulated, no matter how young or old you are—but it's so much more than that, too. A regular music practice takes you away from everything. It gives you something to strive for. Eildih: Music is therapy. My students tell me how much it relaxes them—the unique concentration and immersion of playing gives the soul a bit of quiet, and positive energy, and that's so good for all of us. That's why we're here.